How to make THE BEST pizza at home. 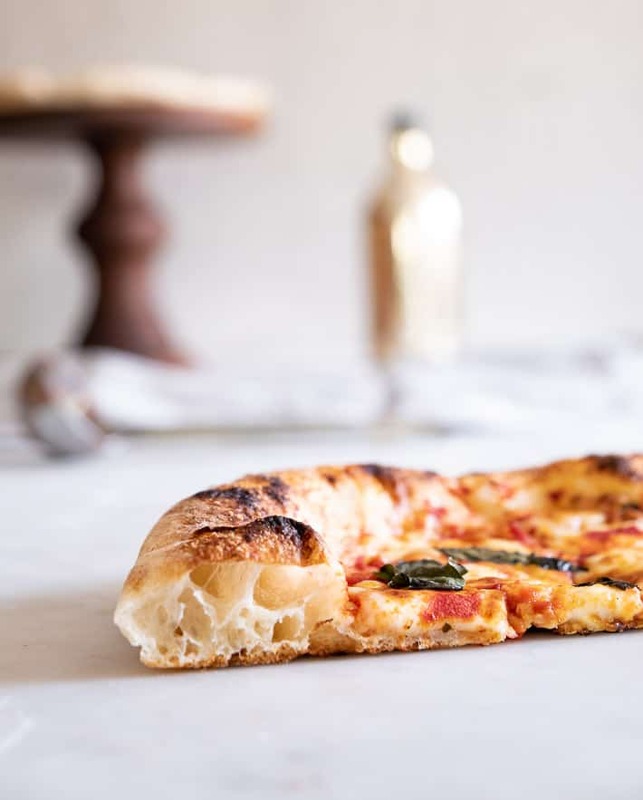 Wood oven style pizza made right in your regular oven. A post that’s been yearsssssss in the making. I’ve been making pizza since I was around 13 or 14. It’s the second thing I learned how to make, the first thing being french fries of course. Looking back on my original pizzas using store bought dough, sauce and cheap pepperoni I’m moderately horrified at my results. The crust was gummy and limp and the pepperoni hard as a rock. But I ate every bit of it and continued on my perfect pizza making quest for the rest of my life. That of course led me to the tipping point of crazy in my pizza life, when I built my own wood fired pizza oven. 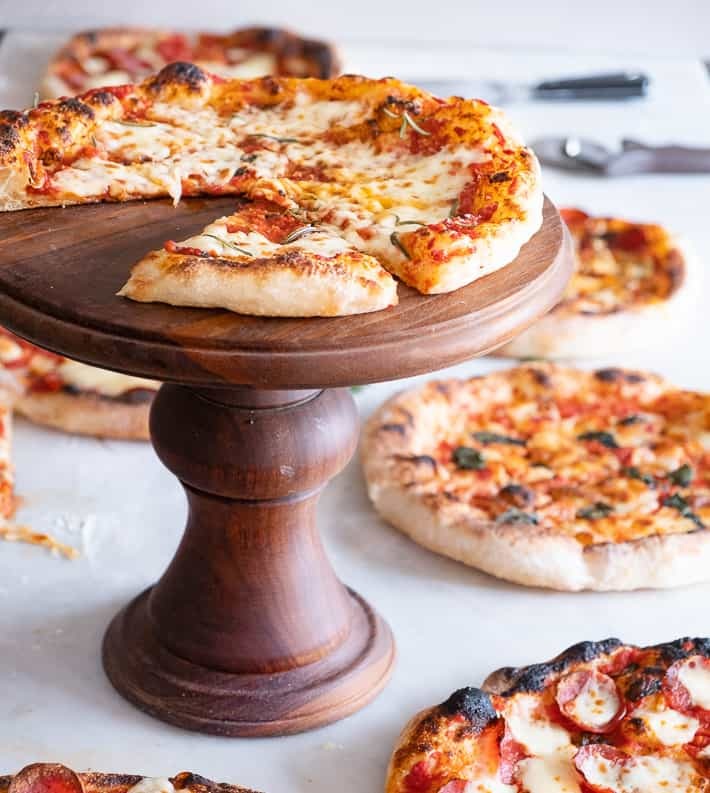 You can read about how to make your own pizza oven right here. 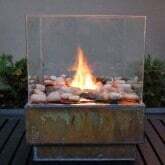 I’m amazed at the amount of my readers who built their own oven after reading my posts on it. Today I’m going back to basics with how to make a restaurant quality pizza at home in your own oven with store bought dough. Because frozen pizza is for suckers of prison inmates. I said it. And I mean it. Plastic bin with lid for “proofing” dough. Click here to go to a curated list of all my pizza making supplies on Amazon. EVERYTHING. All in one place. Don’t worry, you don’t need everything on the list, only the things that are in bold. The dough and the cast iron pan. Everything else just makes your life easier. The more pizza you make the more you should consider getting these extras. 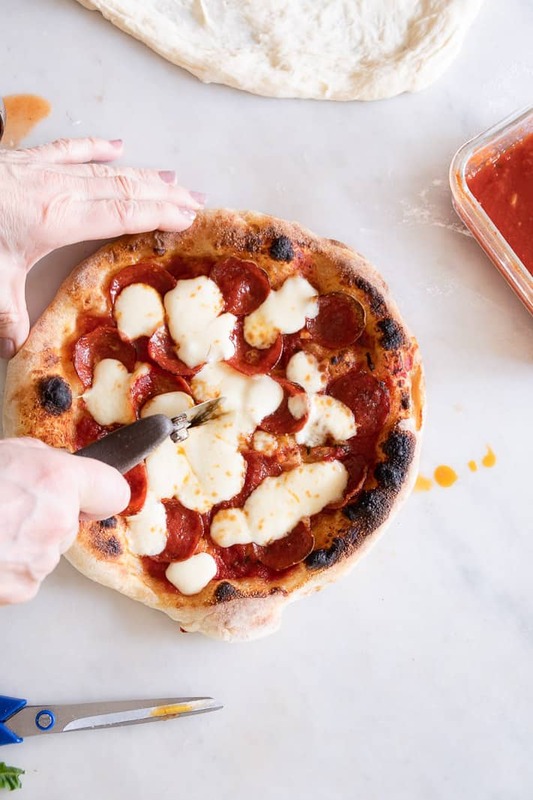 I’m saying to use store bought dough, and you CAN use store bought sauce as well, but homemade sauce will make a huge difference in how your pizza tastes. In fact ALL the toppings should be carefully selected. I’ll guide you through all of them. 1 litre pressed tomatoes or the equivalent of canned tomatoes. Mix all the ingredients in a sauce pan and simmer until thickened slightly. This should take 10-15 minutes. If you’re using canned tomatoes, mush and crush the tomatoes with your hands before simmering. The day you bring your dough home from the store, divide it into 250 gram pieces. Form each piece into a tight ball by stretching the sides of the dough and tucking them underneath. Keep doing this until the top of the ball is nice and tight. I also pull the ball towards myself on the counter to help create a tight surface, but you don’t have to do this. Just stretch and tuck. Your dough should be round, tight and have no air pockets on the underside of it. 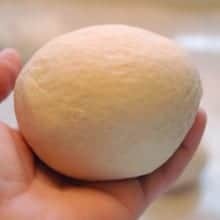 Pinch the bottom of the dough ball together if it needs it. Put all your dough balls into a proofing box. This is where the plastic bin comes in handy. If you don’t have a plastic bin, then put your dough onto a flat cookie sheet and cover with plastic wrap or a large bowl. Cover your proofing box with its lid. Technically you shouldn’t let your dough touch because it will stick to the other balls and deflate when you struggle to remove it from the proofing box. To help with this you can dip each ball of dough into flour before you put it in the proofing box. Literally place the whole dough ball into your flour bin, shake it off and then put it in your proofing box. If your dough isn’t touching there’s no need to flour it. Letting the dough rest for a full day or two improves the quality and crumb (texture/air holes) of the pizza crust. You get nice big pockets of air in the crust. First things first … do NOT roll your dough with a rolling pin. What makes pizza crust delicious and perfect is that it’s filled with air bubbles. That makes it light, chewy AND crispy. If you roll the dough with a rolling pin you’re smashing out and squishing all those air bubbles the yeast made. If you’re going to roll your dough you might as well just put a tablespoon of tomato paste on a cracker and call it a day. Remove the dough from your proofing box (or cookie sheet) carefully. You want to retain the shape and air in the dough. Dipping a putty knife in flour and using that to cut and lift the dough works well. Put your dough onto a well floured surface so it doesn’t stick. Your dough will be sticky. Gently flatten the dough out into a disc with your flattened hands. 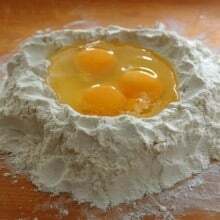 Starting in the centre of the dough, and using your finger pads (fingers placed close together) push down on the dough, working the air bubbles out towards the crust. You aren’t making your dough disc bigger at this point, you’re pressing the air into the crust. Just gently press your fingers over and over from the centre of the dough to the edge. 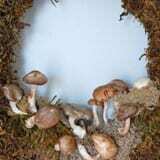 This will naturally form a crust that’s filled with air pockets. Hook your finger pads on the underside of the crust edge, while holding the rest of the dough down with your other hand. Gently pull the crust outwards until you feel resistance. Once you feel resistance, flip the dough over your other hand, and give the dough a quarter of a turn. Repeat this until the dough is a 10″ circle. This is technically the right way to stretch dough. I prefer to spin it over my head like I’m living in a pizza cartoon because that’s the way I taught myself to stretch dough. To begin with just stretch your dough out any way that feels natural to you. Google stretching dough. There are many methods. If the dough feels tight and like it doesn’t want to stretch, cover it with a damp towel and let it rest for 10 or 15 minutes. It’s just angry at you. It’ll get over it in. I am *just* practicing this technique and after practicing on a few more balls of dough I discovered a) it really gets easier the more you do it and b) it’s much easier to do with homemade dough. Homemade dough is just easier to work. 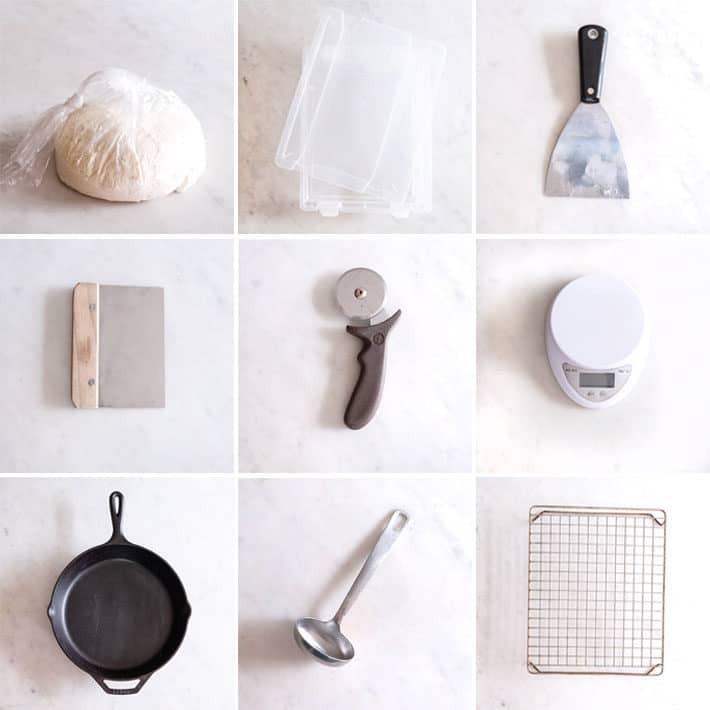 Once you’re ready to make your pizza, get all your ingredients ready. Sauce out, cheese grated or sliced, basil leaves picked etc. etc. Set an oven rack is it’s approximately 8″ below your broiler. Turn your oven to the hottest temperature it will go to. For me that’s 500 °F. The longer you let the oven heat up the better because you’re building thermal energy. Let it heat up for at least an hour. 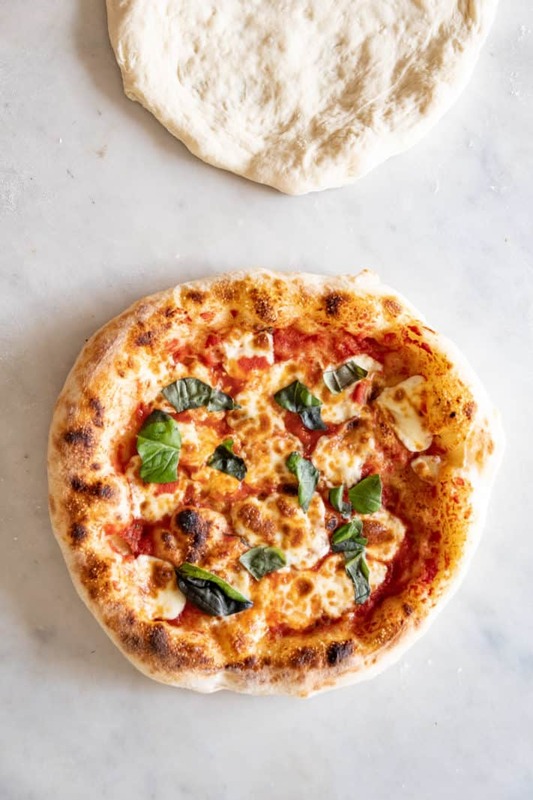 Once the oven is heated up, and your dough is stretched out you can start making pizza! Put the cast iron pan on a burner set to high and get it smoking hot. I use med/high because my range gets so hot. Change your oven from bake to broil. You may need to leave your oven door open a crack for broil to stay on. 6. 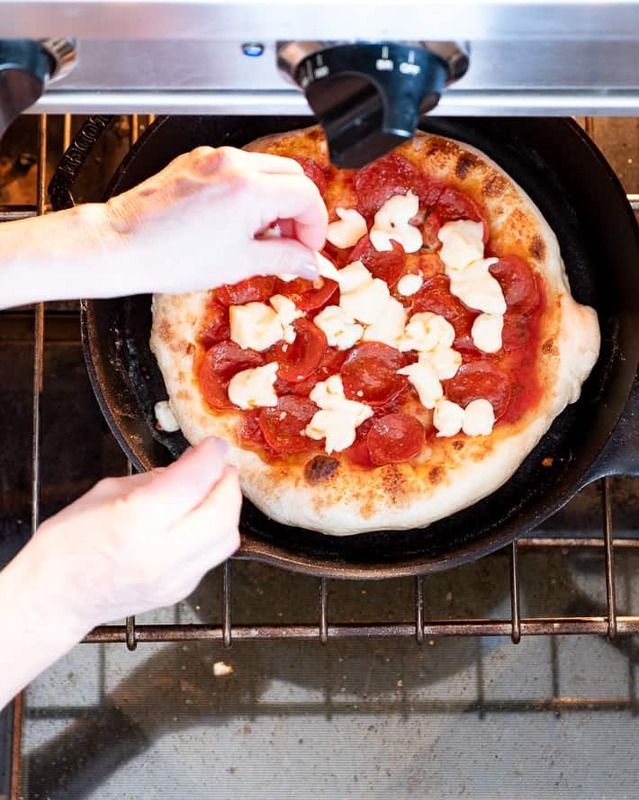 Lift the stretched dough from your counter to your your cast iron pan. Turn the heat down to low. 7. Working quickly put 1/3 cup of sauce onto the pizza and any other toppings you are using EXCEPT the cheese. Do NOT add the cheese. 8. By now the bottom of the pizza will already be getting crisp. Using an oven mitt, place the pizza into the oven. The whole process of getting the dough into the pan, covered with toppings and into the oven shouldn’t take any longer than a couple of minutes. 9. Once it’s in the oven, under the broiler, cook for 3 minutes. 10. After 3 minutes, pull the pizza out quickly and put the cheese on. Then it goes back under the broiler for 2 minutes. Keep an eye on it! 11. Pull the pizza out … it’s done. You just made the world’s most delicious, technically perfect pizza in your oven. 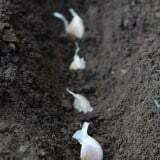 The bottom will be crisp without being overcooked and tough. 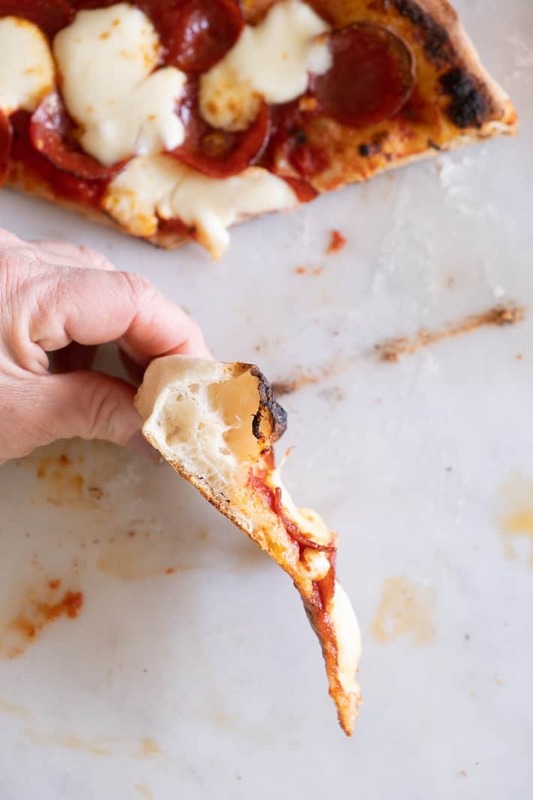 The pizza crust should bend when you hold it straight out, not stick out stiff. You have two options for cutting it, a pizza wheel or scissors. Pushing the air to the edge when you’re stretching your dough is how you get a crust with air pockets like this. It should be light and chewy not dense and tough. You can either shred or rip your cheese into pieces. I like pieces, but have nothing against shredded either. All cheeses are not created equal. If you can find “Pizza cheese” that’s the cheese to use. It has a different moisture content than regular cheese and it’s where you get the stretch and gooeyness. Even with all these instructions there’s going to be trial and error in making the perfect pizza. Your broiler may run hotter or cooler so you might need to adjust the amount of time your pizza is in the oven for instance. You’ll get better at stretching out the dough the more times you do it. And you’ll get more adventurous with toppings. This is a good base to build all other pizzas on, but on it's own it's Neapolitan pizza perfection. The traditional pizza from Naples, Italy. Place an oven rack 8" beneath the broiler. Set oven to highest temperature (often 500 degrees F) and let the oven preheat for approximately an hour. Stretch your pizza dough into a 10" circle. Heat a 12" cast iron skillet over high heat on the stove until it's smoking hot. Switch oven to broil mode while the cast iron pan heats up. Once the pan is hot, lift your stretched pizza dough and place it in the hot skillet. Immediately turn the burner down to low. Ladle 1/3 cup of store bought or homemade pizza sauce onto pizza and spread it out. Check under pizza crust to make sure it has started to brown slightly. Place entire pan into the oven directly under the broiler for 3 minutes. Keep an eye on it, you may need to turn and rotate the pizza to so it cooks evenly. Pull the pizza out and add the cheese then stick it back under the broiler for 2 minutes. Take the pizza out and slip it onto a cooling rack so the bottom doesn't get soggy. Cut with a pizza wheel or scissors. If you're using cans of whole tomatoes, pour them into a bowl and squish and squeeze the tomatoes with your hands until they're mushed up. Combine all the ingredients in a frying pan and simmer until slightly thickened. Around 10-15 minutes. ALWAYS keep your dough covered. It doesn’t take long for a ball of pizza dough to dry out and form a skin which will make stretching it impossible. Seriously. This is easy to forget and the biggest mistake I used to make alllll the time. 250 grams of dough makes a 10″ pizza. 1/3 cup of sauce for a 10″ pizza is a good starting point. 2.5 ounces of cheese for a 10″ pizza is good. Quality ingredients really do make all the difference. Fresh basil, homemade sauce if you can and actual pizza cheese. Pepperoni! For the home pizza maker Hormel makes a great pepperoni. It’s a “cup and char” pepperoni which means it curls up when it cooks and makes the edges charred and crispy. You can also use traditional flat pepperoni which is a bit bigger. Taste different brands. 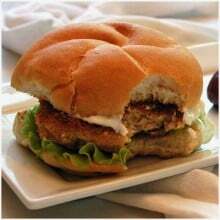 Some are spicy, some saltier and some greasier. Figure out which brand you like the best. The taste of each ingredient makes a BIG difference in the taste of your final product. If you’re adding fresh basil to your pizza, add it after the pizza is cooked. Throw it on immediately after you take it out of the oven. If you want to learn even more about pizza making you should buy the book Mastering Pizza by Marc Vetri. It will walk you through how to make the best dough at home, different types of flour and different styles of pizza. It is a fantastic book. Now go out and buy a ball of pizza dough. 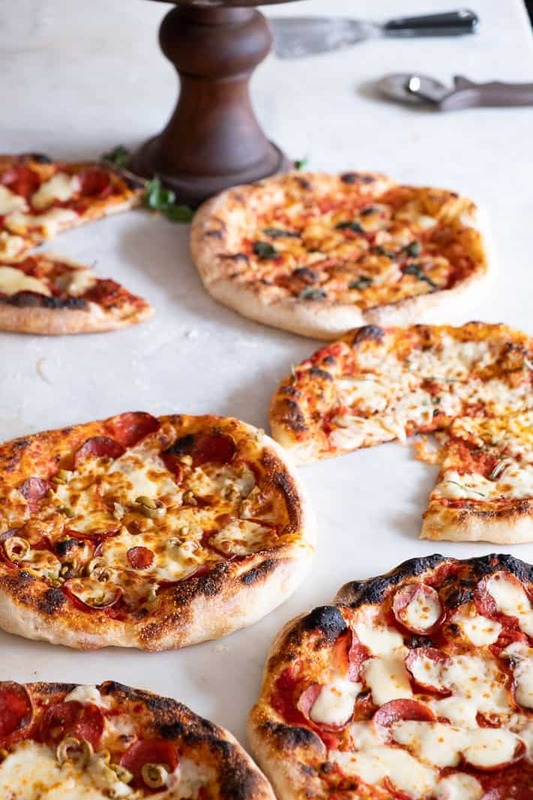 You’re only one ball of dough away from a perfect pizza at home. 7 lbs were gained in the making of this post. Omg, that answers all the reasons my pizza crust isn’t as good as it should be! Now I want pizza and I’m annoyed because I don’t have everything and it’s late. Thanks for the great directions and pics! Karen. I am in Ontario, southwest of you. Which grocery store did you find the dough in and what section? I have never seen it before. Frozen yes, fresh no. Help Please and Thanks. Hey Jo, I’m not Karen but wanted to chime in. 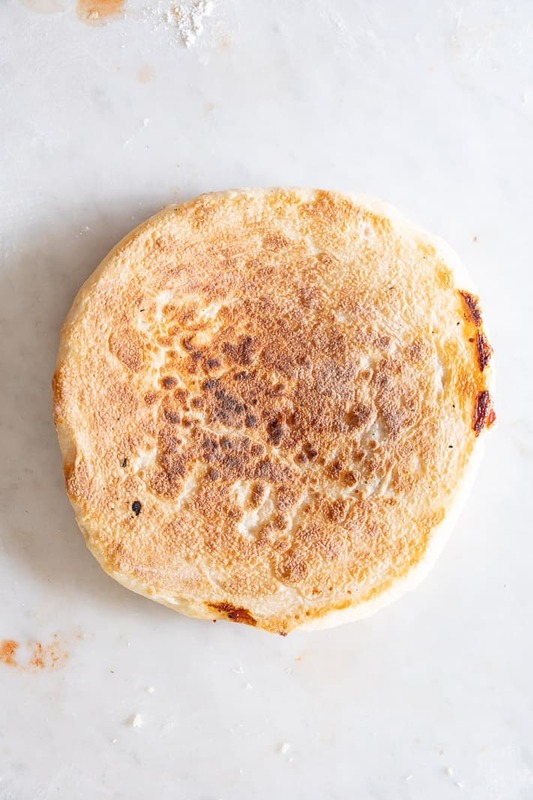 I’m in Toronto, and I see fresh dough just about everywhere, almost always in the deli section near the cheeses, meats, and various containers of dips like hummus – usually around all that stuff. They have especially nice doughs at Longos and Highland Farms, but even Metro has a selection of fresh whole wheat or white dough. If in doubt, head to a gourmet or Italian grocery store. True! It’s in the deli section. ~ karen! Small town here. No deli. Metro I think is sobeys that is in town here. Thanks. You can also use frozen dough Jo! Easy. Just let it thaw out and do everything else I said. 🙂 ~ karen! Also, Sobeys, if you have one near you. Around here Loblaws/Fortinos has the best pizza dough. Metro also sells dough like this but it’s more bread-like. It’s not as good. ~ karen! I’m also a wood fired pizza lover. Best thing I ever built. At full steam it’s over 500 degrees C and cooks a pizza in about 100 seconds! I love your oven! Way to many overkill pizza ovens on the internet putting folks off building their own I reckon. You can have fun with a pile of bricks and a concrete slab to get you started. Do you have any idea just how many people around the world will be making “YOUR” pizza for supper tonight? 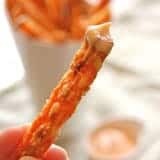 I have a feeling it will be like your recipe for crispy sweet potato fries, a little tricky, but so worth the time & effort. The trickiness is only in how your oven acts really. You might have to get a feel for how hot it is or how close your pizza has to be to the broiler. It doesn’t take long to get a handle on it though. 1 or 2 pizzas. 🙂 ~ karen! Well since you “talked” me into buying a Bluestar exactly like yours (I can’t remember if that was a sponsored post but they really should send you a royalty cheque for mine) I will be following your method and temperatures exactly as posted, to give them a try (but I’ll be using my own sourdough pizza dough.) Pizza happens about once a week around here. 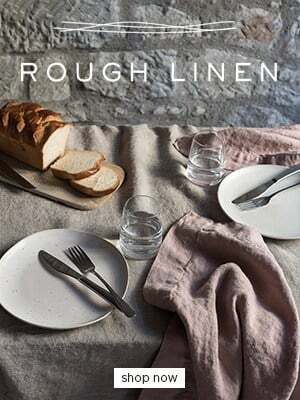 I can already see how your method of dough stretching will be an improvement on mine. Thanks! Thank you! I’ve been making my own pizza dough and very picky with the ingredients I select… and then like an idiot I have been rolling out my dough! Wondering why after hours of proofing I still couldn’t get those amazing air pockets! So thanks and everything, but I have a feeling I may need to go purchase bigger pants after this revelation. You can either cook them all freeze the cooked pizzas whole (works great) or you can freeze the balls of dough after you form them into tight balls. Just take them out of freezer on the morning or night before you want to use them. ~ karen! I never knew there was a pizza pepperoni made to curl up and char – YUM. 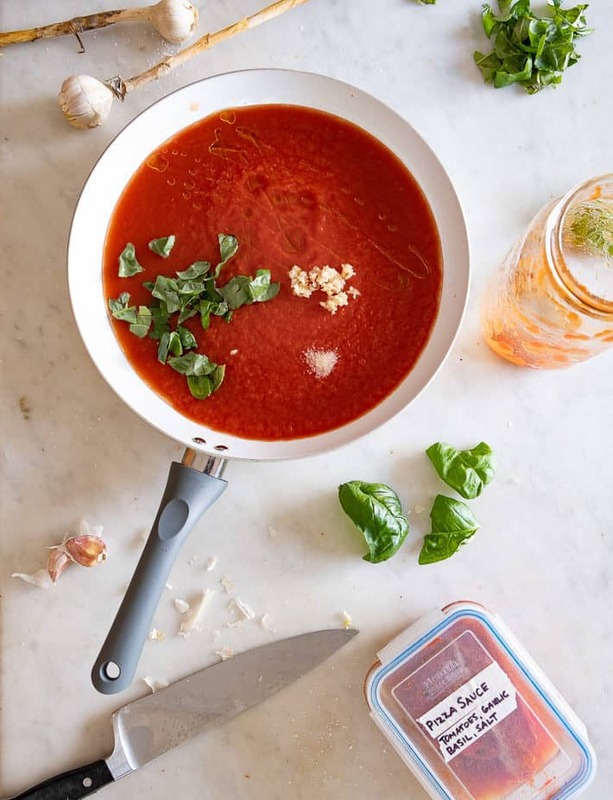 Your sauce seems extremely easy – quicker than standing in the store isle trying to pick a good sauce. Do you grow your own pizza basil? I adore sweet basil but mine hates living in Florida and pretty much dies every time I try to plant some – which kind do you use? Pushing air pockets to the edge sounds like great exercise – something new I learned today about ‘crumb’ and why the air pockets are good. You are a fountain of info – thanks. Here in the Sacramento area of CA. I grow sweet basil every year in our backyard. Just the regular Italian Basil and sometimes Purple Basil. But I keep it in pots in a semi shady area of the yard. It works great. Thanks for all the tips- it’s like you critiqued my pizza! I can’t wait to try it. 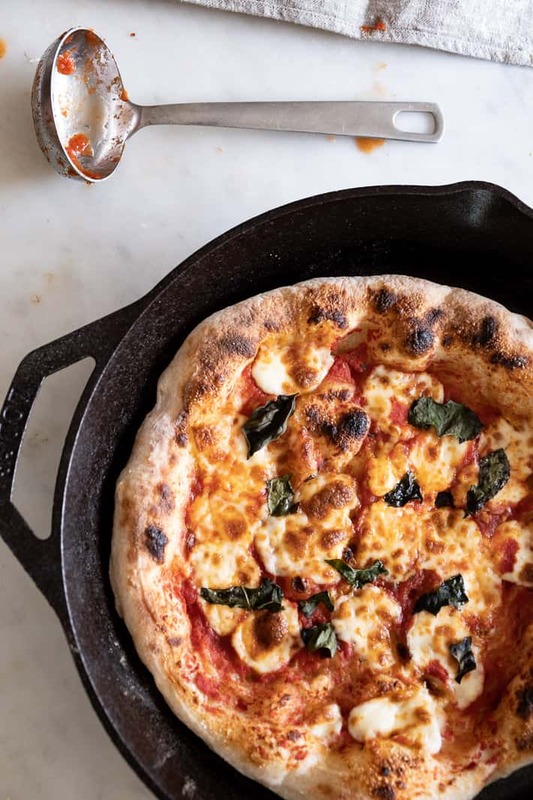 How do you feel about using a pizza stone instead of the cast iron pan? Hi Sue! I don’t like pizza stones. 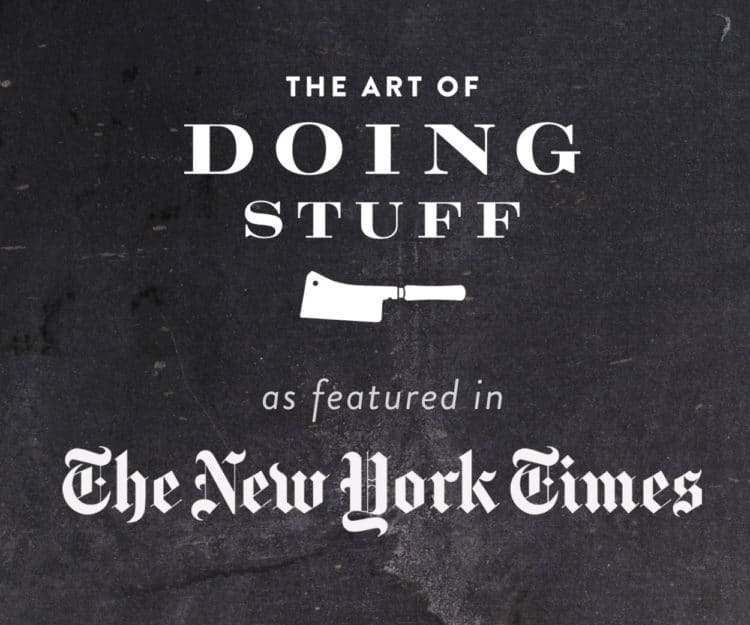 Which is why I featured cast iron in the post. I’ve tried them but have never found them to create great pizza crusts. :/ ~ karen! I switched years ago from the pizza stone to a pizza steel. It’s amazingly better. It’s heavy as all hell but it acts a lot more like the cast iron. I find I get very close to wood-fired oven on the steel. We use a steel as well. Great crust and no chance of cracking. Ours is sized for our oven or for our bbq- I love putting it out there and using it to make flatbread (I’d a great height and a nice big surface). We didn’t buy it online, but went to a fabricating shop and had them cut us a piece to size (3/8th thick – so seriously heavy), then washed and took the angle grinder to it to clean it up and then seasoned it like a cast iron pan. NAILED IT! with home made dough, but this time I used my trusty lodge pan instead of the pizza stone. Easier to handle and very efficient. All very helpful hints as usual. You made pizza already??? By 10:30 in the morning? I’m confused, lol. ~ karen! 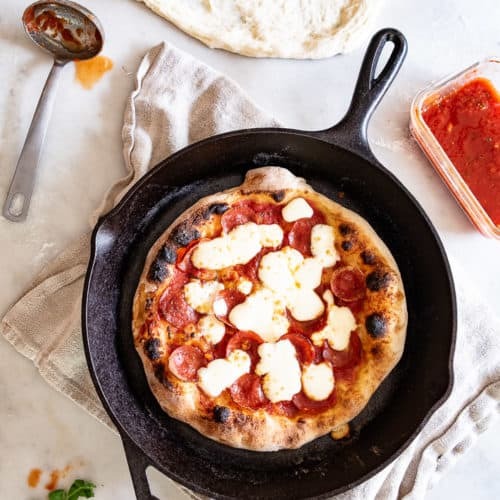 Long story, had some leftover pizza dough from yesterday (when our grand daughter was requesting her fave), and my Russell requested that I use the rest of the dough before I went out, so here I was making pizza at 10am, but this time with your suggestion, using the cast iron pan. I’ll NEVER use the pizza stones again, this is way easier. I’ve been waiting for this post! I love to make homemade pizza, but yours always looked better and now I’m going to try it your way. Great tips and tricks. My question now is, can you do a post about different topping variations? I get so tired of only making cheese and pepperoni. Thanks so much! I chop up some red and green peppers, onions and mushrooms and saute them a little and top our pizza with them. Have also used Italian sausage with it. Also have used two different cheeses at times. 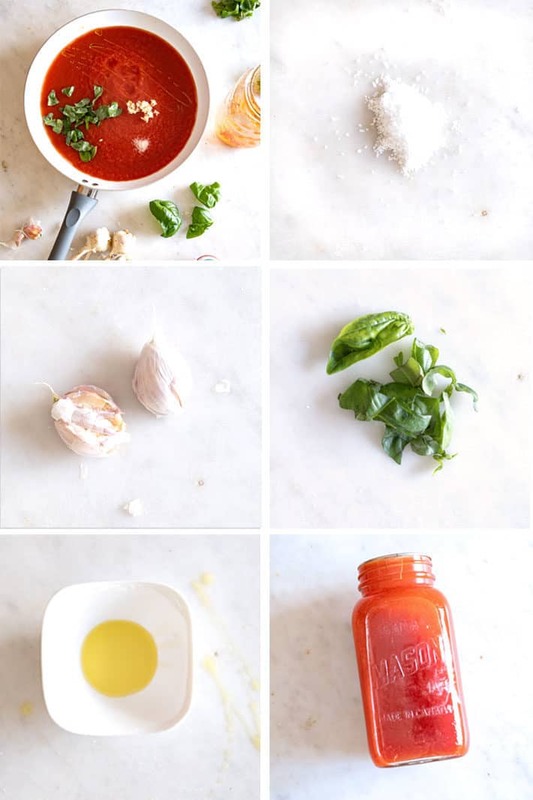 Always use homemade pizza sauce, so much better. Can’t wait to try it!!! A couple questions: Do you have a link to your proofing box? Is it food grade? 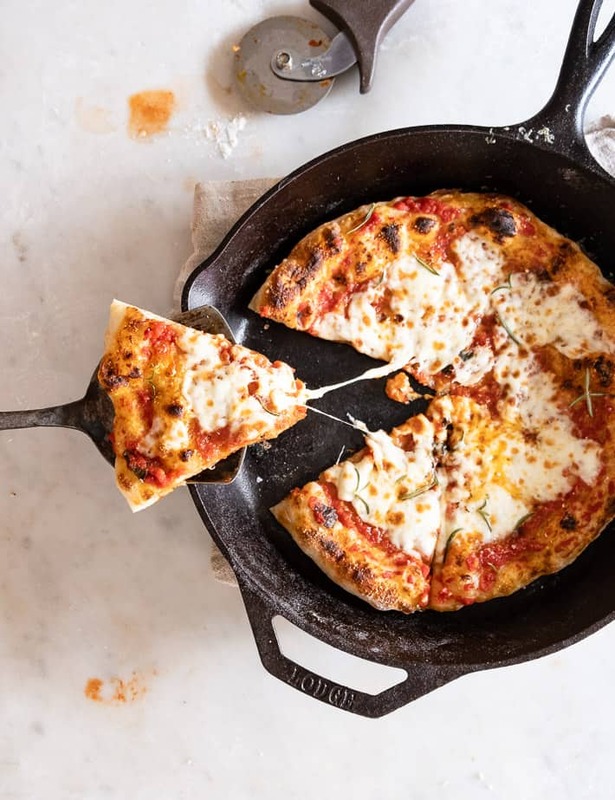 Could you explain why to favor a cast iron pan over a pizza stone in the oven? Thanks for all you work to share the wealth of doing stuff. 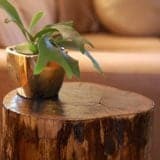 Thanks for all your hard work and research on this post! I can’t wait to give it a try. 1. Do you have a link for your proofing box? Is it food grade? 2. 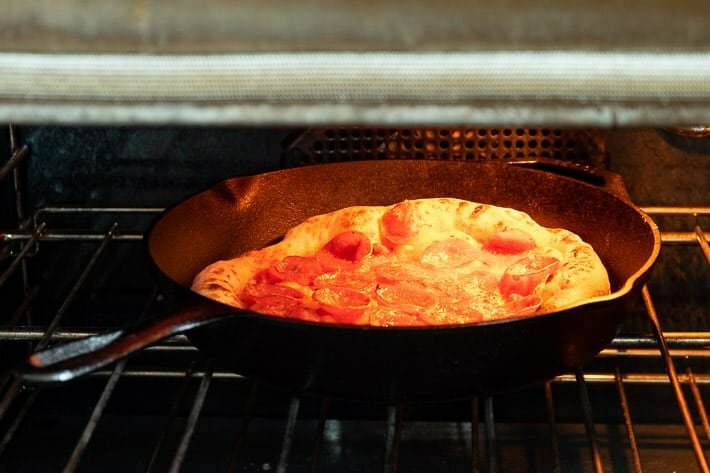 What are your thoughts on a cast iron pan over a pizza stone in the oven? Thank you for teaching how to doing stuff!!! Hi Linda! I don’t have a link for the proofing box because “actual” proofing boxes are about $50 on Amazon! They’re just plastic boxes!! So I got mine, which is perfect, from my local dollar store. It was in the storage aisle, not the food aisle, but I checked and it’s recycle #5, so that’s food grade. I do not like pizza stones. I’ve used them and never had great luck with them. The cast iron method is much MUCH better in my opinion. (this is why I’ve featured it in this post) And I have a post on my dough. You can see it here. ~ karen! Pizza for dinner tonight! I’ll be heading to the store right after work, and my husband will be so happy. Don’t cringe too much, but I’m going to try to make a low carb crust. I store the pizza stone in the oven, there when I need it to bake pita! The cast iron pan stays on the stovetop. It bakes perfect pizza on the stovetop! Saw a tv chef do that. Did not know about buying fresh dough. 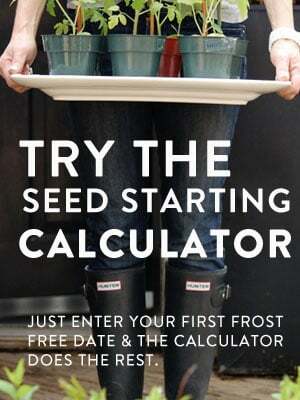 Cool idea. But I like to make the dough! Further to your suggested utensils, I have the same kitchen scale (from LVT?) and can highly recommend it to anyone looking for a good one. It’s so handy to have when a recipe calls for something by weight… works in metric or imperial. I have that scale, too, and I was just going to ask if I bought it at Lee Valley. I guess I did! 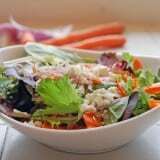 I’ve converted a number of my go-to recipes to weight because it’s just so darn easy to use. I also hoard those square sided Mason jars. So I have no excuses. I must make pizza. Ok apparently I’m a dummy 🙄…. how do I change my email address without “unsubscribing”? I’ve had to go in and unsubscribe you then resubscribe you. Because you created a new account with the new email address I’ll have to delete your old account. So … moving forward. At this point you’ll get another welcome email/confirmation from me. I will now delete your old account that holds your email address. Normally you can just change your email address, but because you started a new account (in frustration I assume, lol) you can’t switch your old account to your new email address. Confused? ~ karen! Yep, but that ain’t news…. we’re good, just as long as I’m (still) your bff from Waterdown…..
Oh gawd. Just shoot me and put me outta my misery. Sorry! Lord, love a duck – a thing of beauty! I just read this and I am starving! I am dying to try this on the weekend. Thank you, Thank you, Thank you! 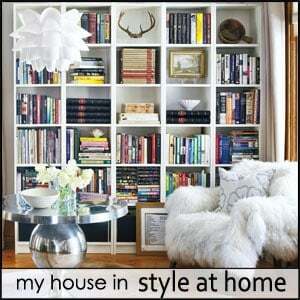 I really like it, but fail miserably at stretching it out – it always shrinks back!!! WTF??!!! So much so, that I actually end up tucking it under the pan, adding the toppings and then trimming the excess with a pair of scissors. 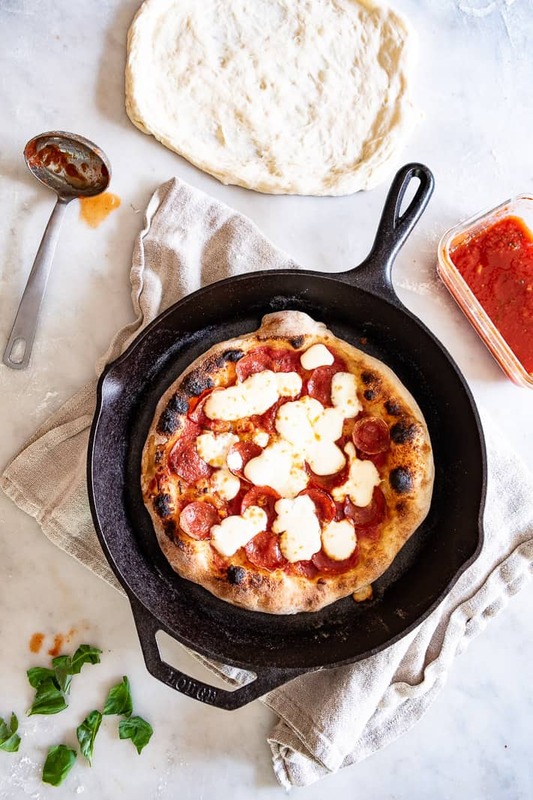 I frequently make homemade pizza and use my cast iron pan, which I love BTW, as well as 2 pizza stones. There is nothing like it and once you have made it, it is hard to buy the “other” stuff. Seriously, the stuff that comes in a box tastes like the box!! Low carb has never been so painful. Very few of these tricks are useful for Fathead Pizza, but I admire your beautiful pizzas. Well no, lol. 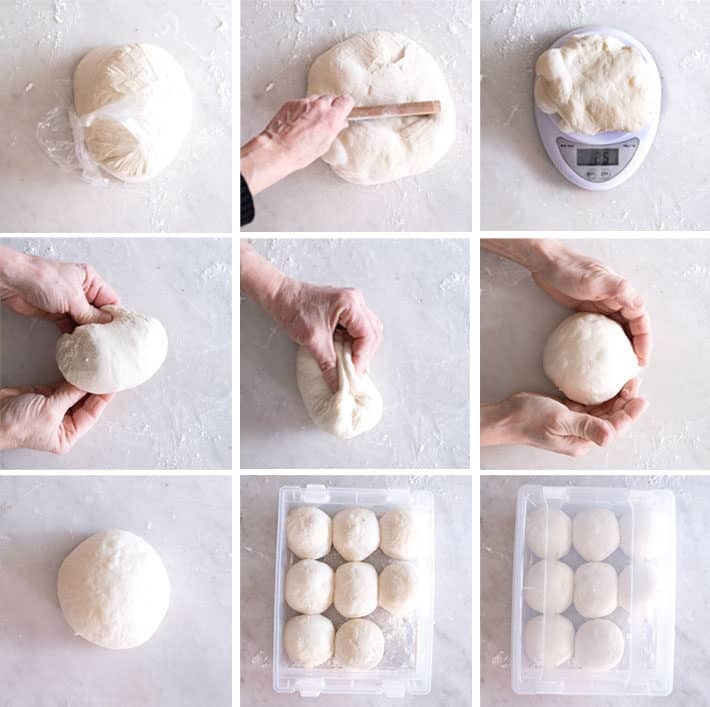 These tips are meant for actual dough. 🙂 I’m sure your pizza was beautiful in its own Ketoish way. ~ karen! This is awesome! We have Publix who sells pizza dough and we use frequently. Unfortunately have used the pizza stone and not thrilled with the results. The crust on the iron skillet is perfect. Can’t wait to try. Now you just need one of my custom handmade pizza cutters to slice! Hey Karen, are the sides of the skillet important to the process or can I use my flat cast iron skillet? Thanks! You can try with your regular skillet Melissa, but the sides do help radiate heat back to the actual crust. If I were you I wouldn’t go out and buy another pan, I’d definitely try a flat cast iron skillet first! 🙂 ~ karen! Oh I’ve got multiple pans/sizes… I’ll stick with your recommendation. Thanks! Good question, I only have a cast iron pot and am almost tempted to try it but will likely just get a pan. I love the Whole Foods dough. Better than most bakery doughs I bought. Convinced even my stubborn Calabrese mother to improvise with store bought dough, which is consistently good, unlike hers, lol. Never tried this cooking technique, but will soon. Looks perfectly delicious! Thanks Carmela! I think you’ll like it, it really hits all the boxes for pizza. 🙂 ~ karen! Thanks for the pizza tips Karen. Now that’s a crust! I’ve always wondered if the store bought pizza was worth buying. Great instructions but how thin should the crust be in the middle. It looks really thin when you were repairing the holes, but should I be aiming for a quarter inch or thinner? Mix in a small bowl hot water, chili pepper flakes and honey. As soon as you take the pizza out brush the honey mixture around the crust to carmalize and make it THE best part of the pizza. Seriously. My family is extra miffed if I skip this part! CAREFUL when you do this..it’s going to big time sizzle on the cast iron.. lean back out of the steam rising or you’ll get chili pepper steam up your nose and in your eyes. Pepper spraying yourself doesn’t make for good fun. Great pizza, and very good directions. I wonder about taking the dough directly from the fridge to be stretched. I have always allowed my dough to warm up for 30 minutes. I tried this with my homemade dough and store bought dough. The store bought really could have used the warm up but both turned out great. Thank you! 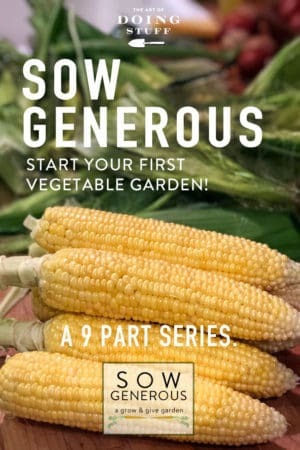 I’m going to work on this until my husband retires in June and, hopefully, joins me at my garden spot in Iowa for the growing seasons (he loves the mountains of northern Nevada and I love to garden …). If I can stuff him full of pizza, that may just do the trick! Too fun! My father made pizzas (and bread) for a living (in Hamilton from the 40s-70s) …. so I never bothered to learn how. although I remember watching him stretch the dough in the bakery. This pizza is to die for! Even though the round of dough stuck together when I was positioning it in the pan, I recovered it and it turned out great. But yes… practice makes perfect. Thank you, Karen! 🙂 Sounds like a good place for it. ~ karen!